For everything else you want close at hand and easy to get to: Straps, biners, all those little Pelican Boxes. Or even the stuff you don't want to get to, but have to put away: candy bar wrappers, beer cans, etc. 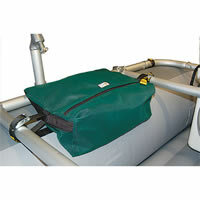 Attached securely to the frame in the rower's compartment, the bag's heavy duty YKK zipper makes one handed use a breeze. The bag is tapered to fit over the tube and measures 13"w x 18"l x 6"h.
From Anonymous of Lotus, California on 6/10/2018 . From Anonymous of Front Range, Colorado on 4/26/2015 .